← The aliens are coming! The aliens are coming! On a lark I try my television. Last time I tried there was no reception. I press the button on the 12v outlet that activates the antenna, plug in my 400 watt inverter, plug the television into the inverter, and turn it on. A quick channel search finds three channels! One is Spanish and two are English. The Lawrence Welk Show is bubbling along (orange polyester suits! ), but soon the Saturday night movie begins. It’s a good one called Goodbye Again (1961) with Ingrid Bergman, Yves Montand, and Anthony Perkins. Walking the crew at sunrise, I can see it’s going to be a beautiful day. The sky is a clear blue and there’s no wind. I’ve been feeling off-kilter the past few days. I’ve lost my equilibrium. I’ve been making a conscious effort to restore my peace of mind. Nature helps. Rick seems to be experiencing negativity, too. His words have rolled around in my mind more than once since he spoke them a few days ago while returning from a walk with Lady. “This place is getting too crowded. I can see I’m going to have to leave in about two weeks. It’s starting to close in on me.” I know that feeling. Walking the desert at sunrise is great therapy. I discover some new, small mounds of tender plants that have sprung up between some stones. The usual, it’s-good-be-alive antics of the crew always make me feel light-hearted again. I smile remembering how Spike started his day. The crew and I make a trip into town. First stop is the Chamber of Commerce. I fill up my water jugs at the spigot out front. Then I dump my trash in the dumpster in the parking lot. After that I stop at Family Dollar for some laundry detergent and pedicure equipment. My feet look like I’ve been running barefoot across the Australian Outback. The final stop is Olsen’s IGA store. A regular can of Maxwell House Coffee . . . $6.19! Kraft’s Grated Parmesan Cheese . . . $5.49! I throw the stuff in my basket, and remind myself I pay no rent in a lame attempt to neutralize the pain. My grocery shopping experience is not fun. Loud music pierces the air. Some woman who’s managed to develop the dubious talent of combining a high-pitched screech with a full-force yell is tearing holes in my eardrums. I scan the shelves with my hands on my ears. By the time I make it to check-out, I’m reeling. Later I ask Rick if he’s had a similar experience. Without missing a beat he explains, “Oh yeah. It’s the weekend and the manager’s not there. The lunatics are running the asylum.” Boy, he really knows how to summarize a situation! By afternoon the sun is hot. In Arizona, once you’re out of the direct sun in some shady spot like the back side of the trailer, the air is quite a bit cooler. I open the window on the shady side and that cool air wafts over the bed. Oh, I think I’ll lie down and plan my next move. I fall into a delicious nap, the kind I haven’t had in a long time. Supper is a green leaf salad with cukes, radishes, and a mound of Olsen’s potato salad, followed by one of those measly snack-packs of orange jello. Oh why didn’t I buy that pie? I’m disappointed that I don’t have more photos in this entry. It took twenty minutes to insert that cactus pic. The crew is pestering me for a walk. The sun is low in the sky. When we return from our walk, I’ll see if my television reception is still good. If not, I’ve got a backlog of books on my kindle. This entry was posted in Simple living and tagged Arizona, Darby Wells, fulltiming, Goodbye Again, Ingrid Berman, movies. Bookmark the permalink. Nice that you get tv once in a while – nice break sometimes. Once again beautiful writing, as always. I love the catus pic, wow just awesome, saved it to put on my iphone as my background, hope you don’t mind. My minature Schnauzer does the same thing, I just laugh at him and he stands up and does the same thing the look of “what just happen”, and then the big dog look like ah ah I meant to do that, as he leaves because he is mad at me for laughing at him… thanks again for sharing and a great post. You’re welcome! I have to be careful about laughing at Spike. He gets mad, too. He won’t look at me until I apologize. Sue, remember that you scrimped and saved and sacrificed for a LOT of years to be ABLE to pay “A regular can of Maxwell House Coffee . . . $6.19! Kraft’s Grated Parmesan Cheese . . . $5.49! ” The sacrifice time is over and the ENJOY time is here. As you move forward in your life, you may want to make a list of the “staples” that you always want to have on hand and replinish the stock when you hit a Walmart or find them on sale. Oh the other hand, why bother? Just pay the local price and enjoy the freedom you worked so hard to get. No need to bother with a list. After all these years of grocery shopping, my list of staples is a permanent imprint on my brain. When I can’t remember anything else I’ll be able to recite … “soup, crackers, coffee, peanut butter, cooking oil . . . .” I’m bet you’re the same. I did have a pretty good stock of items from Walmart but I used some of it up while at Quartzite and since I’ve been here. Sue, we had not seen the Lawrence Welk show in years. Well, we did run across it the night of the orange suits. OMG, 1st thought, CCS band jackets with straw hats. Were you around to see them?? Thank goodness we wore black slacks for gents and black skirts for gals. Loving your stories. You are a blessing everyday!! Ha! “The Night of the Orange Suits” sounds like a horror flick! Now that Quartzsite is over and thousands of rigs are hitting the road, some of those people are bound to be heading for Darby Wells. Rick’s right,,,,,,,it just may be getting crowded. Wandering Willy is probably headed your way shortly. I told him to keep an eye out for you. We are rolling out for California in the morning…………..
Good luck! I’ve enjoyed your posts and pics of the Bouse area. Some of the people here are fiddlers. They’ll be moving out in a few days. Thanks, HoboJoe! Nice to know you’re still w ith me. I think I’d rather hear Lawrence Welk than the banshee yells you heard in the grocery store!! I haven’t been living in the desert but I hate that too. Beautiful cactus picture. Yeah, when did yelling become singing? It’s not so much the volume… I love a good, raspy rocker belting it out with an electric guitar. It’s the screaming with phony “emotion” that grates my ears. Great post once again, Sue. Love your description of Spike falling off the bed. My Mazy does this too, and it’s always good for a laugh. 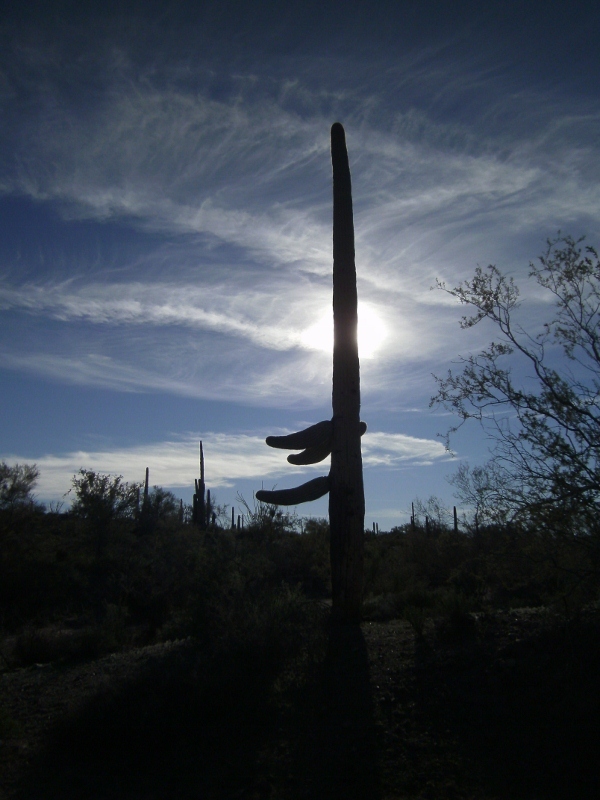 Your last saguaro photo looks like it’s doing a hula dance! And I like YOUR description of the saguaro! Are you kidding me, JoJo? I’ve seen the same size can of coffee for under $3.00 in Georgia! Guess I’m spoiled. Hi, Linda . . . I like to think I’m pro-solitude! The big advantage to traveling alone is that you can enjoy the quiet and choose when to experience noise and you can shut it off at will. Loud noise is unpleasant when you are given no choice. The last movie I attended made me consider ear plugs for my sanity. Great cactus picture. Choosing quiet is a big advantage of traveling alone. Too many people are subjected to unwanted noise every day in the workplace. That can’t be good. Rick said he’s going to give me a pair of earplugs (He has a bunch for gun practice. ), which I can keep in my purse. I’ve always been sound-sensitive. I rarely play a radio at home and hardly ever when I’m driving. I’m the person at parties who has to go outside for some “fresh air.” Actually it’s to get away from the incessant chatter. Does “the crew” have the anti-snake vaccine? Was just reading Post #131 on Casita Forum (“Quartzstite gathering” post) that there is one available. Glad to hear the desert is “waking up”. It can really be beautiful. One early May, when at Pancho Villa SP, I saw a Bird of Paradise Tree in bloom and fell in love with it along with a Century plant in bloom. You will love the “awakening” as much as I do. It is so relaxing, yet so stirring. Hi, Emily . . . No, the crew doesn’t have the vaccine. It hasn’t been an issue since the snakes are hibernating. That will end, of course. Hoo-boy. ewwwwwwww Em! Nobody wants to think about snakes! eeeeeek! But that is a good thought! Guess we will have to look into it too! Good blog Sue! I am the same way…. hate it when loud music invades my thoughts! I have actually gotten up and gone out of a restaurant before the waitress could bring me water! When asked why by the meeter/greeter/seater person, I told him that the music was so loud I couldn’t think and I didn’t want to be assaulted by music I didn’t even like! He looked at me like I was crazy and said, “Uh, ok!” One lost customer! Hi, Geri . . . Sometimes the person in charge will lower the volume, but most times it’s the “you’re crazy” look or “you’re in a bad mood” look. Um, I wasn’t in a bad mood before I walked in! It is cold and wet here in Battle Ground, Washington. We miss the great weather there in Ajo. We really loved that little town. Our four little bichons made lots of friends walking around the plaza. The music in the IGA store was nice, so we must have been there during the middle of the week… Have you been to the True Value Hardware store? It took us a little while to find it, but was worth the effort. On our search for it, we found a whole block full of pink trailers and a long row of pink mailboxes! I’m sure you must have seen them. When we got back to Battle Ground, my wife started reading the real estate ads in Ajo from one of the little newspapers I picked up there. She knows we’ll never buy one of those little houses, but she likes to have her dreams too! Having too many people close by isn’t my favorite thing either. We would really liked to have met you there in Quartzsite, but like I said, there were just too many RV’s and too many people. I’ve been doing some research on places to camp in Arizona and New Mexico when we return. There are lots of great places to explore. When your blog was added to hitchitch.com, I checked out that site and found some great websites for planning our next trip. Once again, your blog is delightful and I thank you for your generosity in sharing! That True Value Hardware store in Ajo has a little bit of everything imaginable . . . . You have to wipe off the dust to see what’s on the shelves! Arizona and New Mexico are a boondocker’s dream. It’s fun planning the next trip. Thanks again for complimenting my blog. It is a shame that we didn’t get a chance to chat while you were in town on the 29th. I’m pretty gimpy at the moment but I can make it across the street to Olsen’s, just didn’t have any idea when you would be there. I sense there is some hitchitch building up, I hope you find another great camp as you continue your travels. Perhaps our paths will cross again at some point. I was going to stop by after Olsen’s but I wasn’t in the best of moods and I saw you had company. So I decided to visit you today (Tuesday) but I can’t, which I’ll explain in today’s post. Don’t want to spill the beans in the comments section! Hope you haven’t left yet. I am amazed your TV gets more English than Spanish. It was always the other way around for me. Good way to increase bilingual skills. The desert wind Will move you, one way or another. Had a Terrible beep-squeal invade my eardrums in Wallys today. A nap is good. I’m sure the crew demonstrates that. You’re right, so far it’s usually more Spanish than English. I wish I could speak Spanish. I had a friend from El Salvador for several years, but I only learned a few words. I have noticed that books are way back in second place when I am in an interesting area. Books are good but I prefer the real life experience. Have fun. You’re right about that! Most of my reading takes place after the sun goes down and I’m snuggled up in bed. When I try to read during the day, I don’t get very far!